So some time ago – maybe months or years – you decided to go for Lean/Agile. 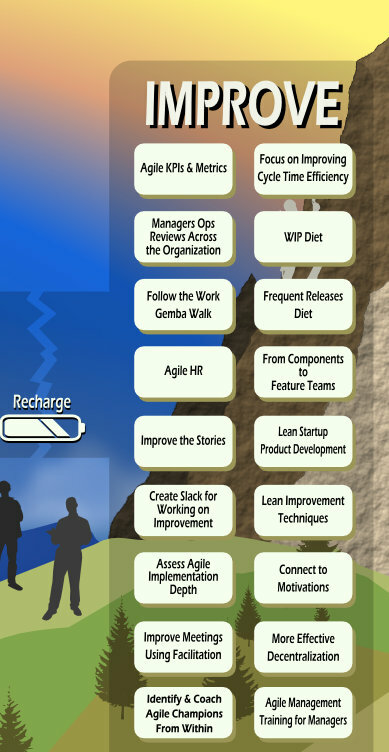 You went ahead and started to use Scrum/Kanban to break the waterfall and achieve a more agile operation. These were exciting times. First, that time of making sure you understand what you are trying to achieve, checking out all the options, building the plan. Maybe forming new teams, maybe not. Maybe you went for an evolutionary change or a big revolution. Then, training people and helping them start doing things differently. You probably had some help from consultants along the way or maybe you had enough experienced/process-curious people on staff to get through this on your own. You spent some months stabilizing things – taking care of all the impediments that surfaced to us the “Scrum speak”. And then, after all this excitement, it seemed like things were actually working. Everyone felt that. It seemed like the journey was finally over. Maybe you even took a look at the goals you set to yourself and saw you achieved at least a major improvement. Maybe things just felt ok. Slowly (in some cases not so slowly…) everyone’s focus moved elsewhere. The retrospectives started to feel routine. The stabilization board started to grow rust. You reached a new plateau of performance. And it was ok.
At some point, you decided you want to get back to the journey. (Yes, you might notice there is a big question here of what are the triggers to get back to the journey and can we do anything as internal/external change agents to help organizations decide to get back to the journey at the right time – not too early but not stay stuck in this plateau too long? maybe in another post…). And you are wondering what are some effective ways to do that. One important step before doing anything is making sure you understand why you are doing it and what you are trying to achieve. This is especially important in the case of moving from recharge to improve because you are trying to nudge a system that is stable so you must understand the importance of moving it. A classic short movie that makes sense to see in this context is “Overcoming Resistance to Change – Isn’t it Obvious” (This is based on Dr. Eli Goldratt’s work in Isn’t it Obvious). You can show the movie to your team and follow it up by a discussion of how it applies to your current context. This is VERY similar to running a SWOT (Strengths Weaknesses Opportunities Threats) exercise, so you can do that instead. 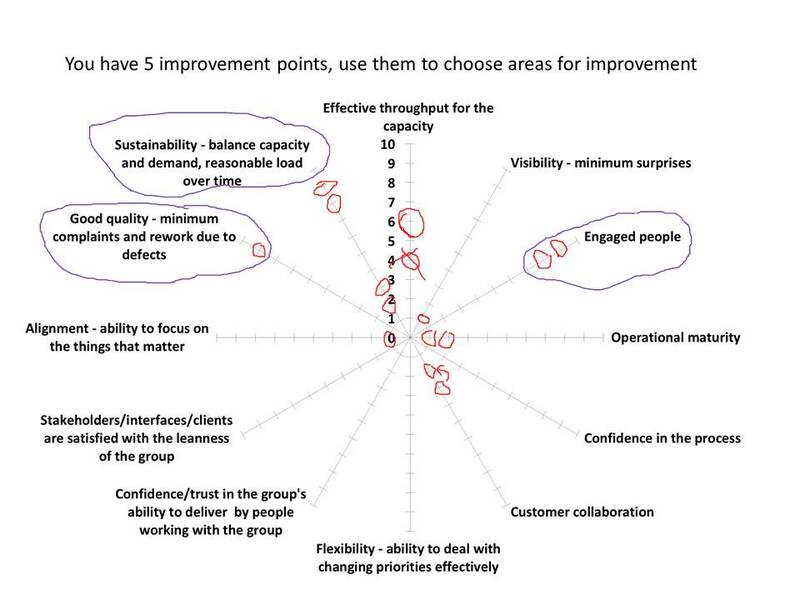 An even more structured way I found useful in the lean/agile context is to give people concrete options for the Strengths – Reasons not to change/Weaknesses – Pains of not changing quadrants in the SWOT/resistance to change analysis. These options are based on the “Starting with Why – Goals for Lean/Agile Journeys” slide deck which we often use at AgileSparks. If you are distributed or want people to prepare beforehand you can do this with the facilitator marking colored circles on a powerpoint slide (as can be seen above), work together on a google spreadsheet, use an online survey like the one here (I made the google spreadsheet used to generate this publicly available here) to get people to think about it either online during the session or beforehand, or use your favorite collaboration tool/approach. In any case, at this point you should have 2-3 clear goals to focus on. 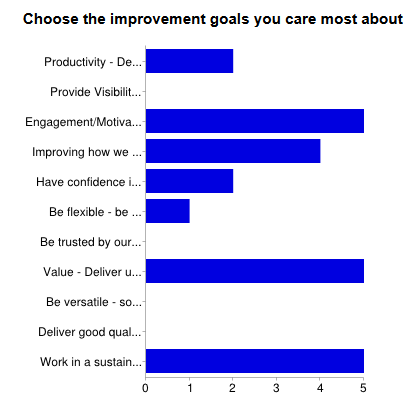 Maybe these are the goals you originally decided to start your lean/agile journey for. Maybe they are different. The group from the first example above started the journey to improve flexibility, reached a good enough level and then moved to other goals. The next step is to assess your current reality and gaps that affect your performance in the aspects you chose to focus on. One way to do that is to simply run a focused retrospective with that goal as the theme. You can do it as a “World Cafe” (or your favorite subgroup based meeting design method) – in essence working in subgroups on the different goals and sharing notes and outcomes. If you are distributed or want to do this part as preparation to meeting face-to-face you can run this as well online as surveys using something like http://www.perfectiongame.org/ asking what is our current level, what are we doing well, what can improve our performance. Another more structured way to handle this phase is to run a depth assessment. I like to use our own Lean/Agile Depth Assessment but feel free to use whatever you like. Now, within each assessment areas, look at the specific gaps you have and choose a few that are the most relevant for the goal you are trying to work towards. Take these gaps and add them to your improvement backlog. Another approach is to look at something like the AgileSparks Way which has a catalog of options for the improvement stage and choose options that you feel as a team are most relevant to your choice of goals. This can be things like running the assessment, examining team formation, going on a WIP diet, going on a frequent releases exercise regime, etc. From here on it is a matter of executing improvement/change. But you have strong forces on your side. You engaged people as part of this fair process (maybe it was your management team, maybe everyone). You started with why. You set concrete improvement goals that are mapped to concrete action items. One last thing you might want to do is to run a vote of confidence with everyone who participated in the process to see whether they think the plan makes sense and is worth pursuing. And if not, iterate and fine-tune until it does. As an interactive session I would recommend setting aside about half a day to a day for this activity. Ideally offsite as an opportunity to open your mind and think creatively. “Doing Food” never hurts as well. This entry was posted in Change Management, Uncategorized and tagged AgileSparks Way, Assessment, improvement, Recharge, Start with Why on June 20, 2014 by Yuval Yeret.